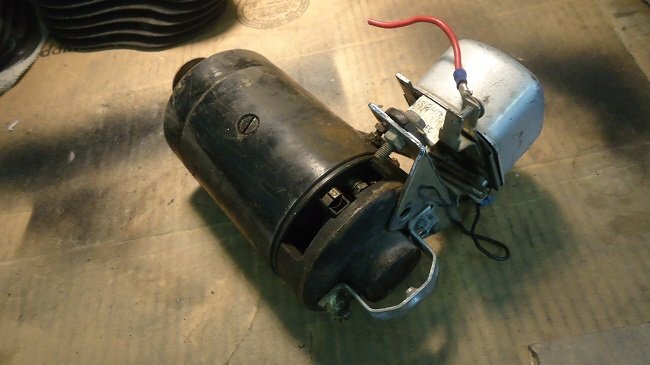 Harley Generator - Repair or Replace? Vintage Harleys are not known for having great charging systems. Your bike's generator doesn't really charge the battery until engine rpm is considerably higher than idle. And if you have an electric starter, trips less than 15-20 miles are not enough to recharge the battery's losses from starting. If your battery keeps dying, stop blaming your battery. That's the first sign a generator not charging properly. Here's a simple way to test it--with everything hooked up properly, and a fully charged battery, start the engine and turn on your headlight. If the light gets brighter when you rev the motor from idle, the generator is working correctly. If you have a multimeter that reads DC amps, check the generator output with bike running. It should be 10 amps or higher. Be careful not to test too long - usually you can test for about 15 seconds, then you have to let it at rest for 15 minutes before re-testing. Consider adding an ammeter gauge to your bike, then you will always if your generator is working. An amp gauge will tell you the amount of amps passing into or being drawn out of the battery. A voltmeter will tell you the "pressure" behind the amps. Remember that amp gauges work in either direction so make sure you don't have the connections reversed. Current flows from negative to positive in a DC circuit. Another way to test generator output is to compare the difference between voltage at the generator and voltage at the battery. This can be also done with a multimeter. Voltage should be higher voltage at the generator. The 6-volt, three-brush generator was in use from the 1930s through the 1950s, and was troublesome. Harley switched to a two-brush generator in 1958. The first of these was the 6-volt model 58, in use from 1958 to 1960. A year later (1961) the model 61 generator replaced it. When Harley-Davidson started replacing their 6-volt electrical systems to 12 volts in 1964, the model 65 generator was introduced, but was quickly replaced with the 65A generator. Be aware that 65 and 65A models look alike, but have opposite-side A and F terminals. The 65A generator was found on Big-Twins from 1965 to 1969, Servi-cars from 1964 to 1969, and Sportsters from 1965 to 1981. In 1982, the Sportster generator was changed to the 65B, which saw use until early 1984. Today, the 65B is pretty much obsolete. 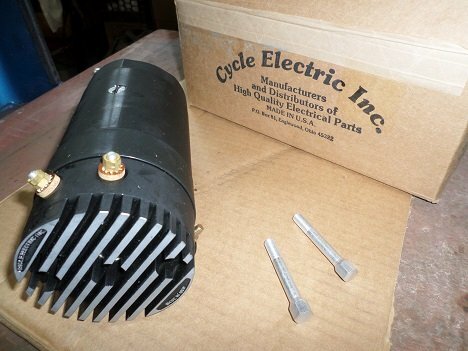 If you have a vintage Harley, a Cycle Electric unit will replace the 58, 61, 65, 65A, and 65B generators. The built-in voltage regulator has a clean look and a two-wire hookup makes installation simple. Cycle Electric offers two 12-volt units and one 6-volt unit with built-in regulators; the DGV-5000, DGV-5000L, and DGV-5006. 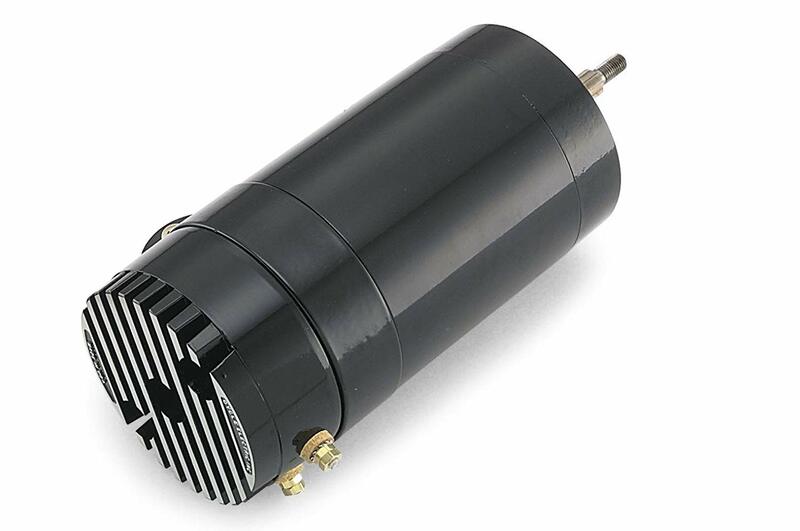 The DGV-5000 generator with regulator will fit 1936-1984 12-volt systems with a 7-amp (or larger) battery. There are several styles of oil deflectors and you will need to re-use your old one (see below). Another Harley generator replacement from Cycle Electric is a low-amp model, the DGV-5000L. This generator is designed to work with 1936-1964 models converted to 12-volts with a 5.5-amp (or less) battery. The DGV-5000L is a good choice when converting 6-volt to 12-volt with kick-start only and battery is 5.5 amps or less. If you are converting from 6v to 12v, make sure the new battery will fit in the battery box. You may also need to replace the battery cables. Harley-Davidson used a 6-volt electrical system on motorcycles until 1964 and on trikes until 1963. If your 6-volt battery and electrical system are in good shape and you're not running auxiliary lighting, there is really no need to convert to a 12-volt system. Also available from Cycle Electric is the DGV-5006. This is a 6V Generator with voltage regulator. The DGV-5006 is for restorers who want to keep their ride 6-volts, but would like a more reliable charging system. If you decide to convert to 12 volts, you can re-use your wiring harness provided it's in good shape. All bulbs--headlight, tail-light, dash lights, etc., all of the old 6-volt bulbs must be replaced with 12-volt bulbs. You can use your headlight switch, brake-light switch, and high-beam switch. They will work in either a 6v or 12v system. 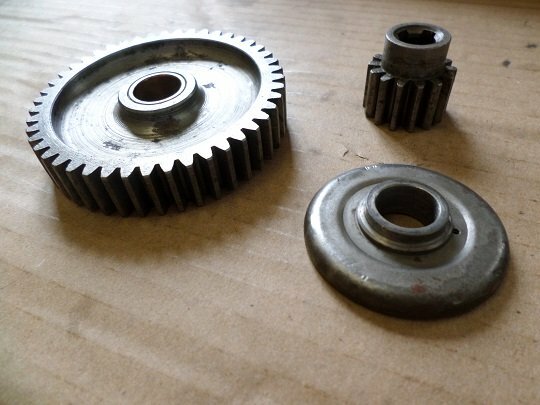 On a three-brush generator, the oil deflector requires a spring between it and the bearing to hold it up against the gear. There is a spring-loaded breather on the inside of the cam cover that rides on the end of the gear. If you are replacing a three-brush generator (1936-1957) with a new-style unit, use H-D 31035-58 oil deflector, and discard spring and old deflector. The oil deflector used on later two-brush generators has a built-in collar. The gear is drawn onto the shaft with a nut until it pinches the oil deflector tight against the inner race of the ball bearing. This sets the location of the gear and locks the armature in place. The oil deflector on two-brush generators also sets the location of the gear. 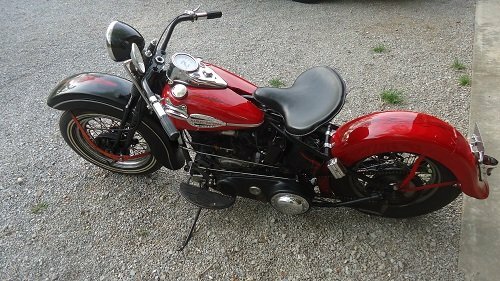 Early Panheads and 45 Flatheads had 1/4"-24 generator bolts. The later two-brush generators (1958-up) used larger 5/16"-24 bolts. To mount a CE generator with an early cam cover, you will need to drill out the bolt holes to accept the larger bolts, or use 1/4"-24 heli-coil inserts in the generator threads. 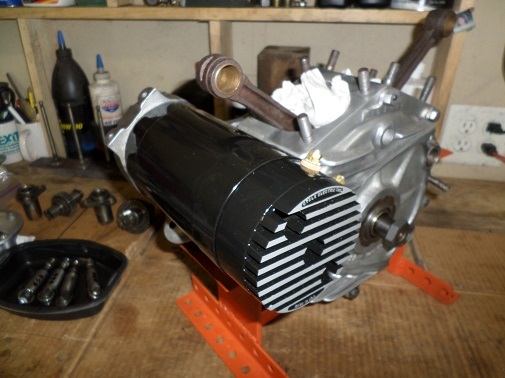 One of the upgrades I made while restoring my 1961 Servi-car was a DGV-5000 Cycle Electric generator/regulator. The DGV-5000 was easy to install and works perfectly. 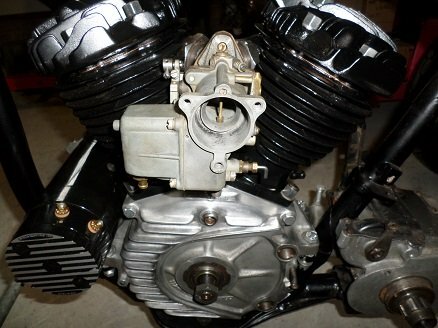 If you're riding or restoring a Panhead, Shovelhead, Flathead, or Ironhead, consider upgrading from the stock generator. 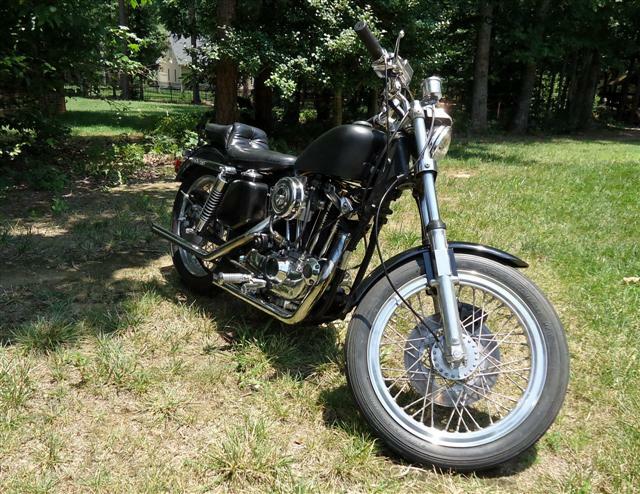 I have found that Cycle Electric offers the highest quality Harley generator replacement. You'll get a complete charging system in one unit, with a higher output and longer service life than your original generator. When you buy a Cycle-Electric generator/regulator, they are polarized from the factory. And remember to not leave ignition on without running for any extended period, or you will damage the generator. All CE generator/regulator units carry a two-year warranty. Cycle-Electric has a good reputation for helping customers if installation issues arise. 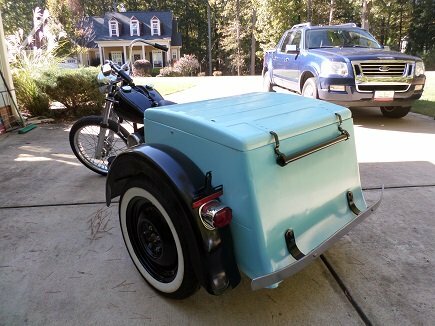 All units are American made, and will truly be the last generator you buy for your motorcycle.